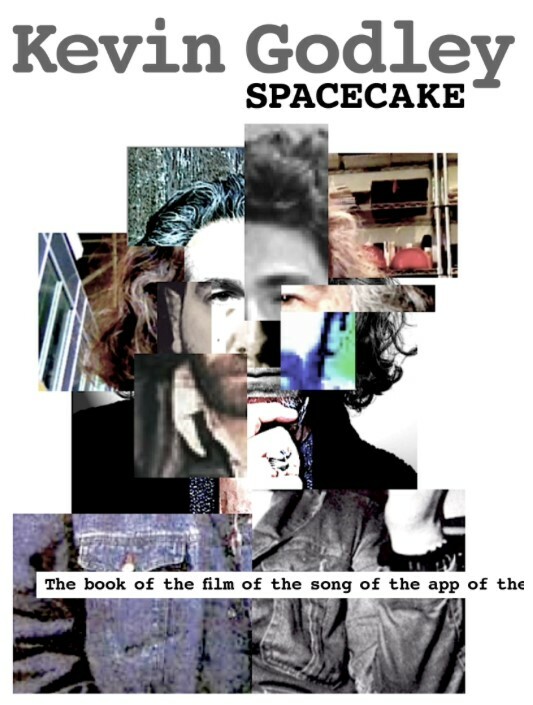 Home / 10cc/Godley & Creme Legend Kevin Godley Releases New Book SPACECAKE on iBooks! 10cc/Godley & Creme Legend Kevin Godley Releases New Book SPACECAKE on iBooks! Ireland – SPACECAKE chronicles the misadventures of a debauched and dangerous masochist as he tantrums his way through the sleazy worlds of Rock & Roll, music video and technology, each squalid escapade dragging him ever deeper into a repugnant maelstrom of sordid excess…well sort of. A wee bit. Actually…not remotely. It’s all about the work really. If you don’t recognize the name, Kevin Godley was a founder member of ground breaking UK band 10cc. (Their single, “I’m Not In Love” continues to be one of the best selling records of all time). As one half of Godley & Creme he went on to pioneer the notion of music video as an art form and was responsible for iconic clips by artists such as Herbie Hancock, The Police, Duran Duran, Lou Reed & Frankie Goes to Hollywood etc, continuing to up his game in solo mode with U2, Frank Sinatra, Paul McCartney, The Beatles & Blur amongst others. KG thrives on re-inventing himself and SPACECAKE, his first book, takes you on an interactive tour of his life via pictures, music, film clips and 27 chapters of abstract insight into how everything from the first hits to WholeWorldBand, his music/video collaboration app, got made. It’s dark in some of the corners though…so make sure you bring a torch. Kevin Michael Godley (born 7 October 1945, Prestwich, Lancashire, England) is a British musician, writer and music video director. He was born in a family with Jewish ancestry, and went to North Cestrian Grammar School in Altrincham. His first band was Group 17 which had its origins in the Jewish Lads Brigade (The JLB). The members were Henri Shalam, Bernard Suffrin, Sydney Kaye and Jeffrey Baker, whose father may have inspired the “Sergeant Baker” character in the 10cc song, “Rubber Bullets”. While attending art college in Manchester Godley met Lol Creme and formed several bands, most notably Hotlegs and 10cc. After leaving 10cc the two became known as Godley & Creme, both as musicians and music video / TV commercials directors. They won many MTV awards for their unique films and were jointly nominated for a Grammy Award for Best Music Video, Long Form for: The Police: Synchronicity Concert in 1986. Godley writes, sings, and plays drums and percussion and in 1990 conceived and directed the TV music special “One World One Voice” that featured a global piece of music focussing on environmental and ecological issues. Godley also became a vegetarian during this period. Both Godley and Lol Creme briefly “reunited” with their former 10cc bandmates Eric Stewart and Graham Gouldman on the 1992 album, “Meanwhile”. However, Godley claims that their involvement with the project was very limited, as the album was dominated by studio musicians. He performed the lead vocal on “The Stars Didn’t Show”, the band’s tribute to the late Roy Orbison. It was the only song on the album not sung by Stewart. Following “Meanwhile”, Godley and Creme went their separate ways. Recently, Godley has moved into developing a music platform that combines audio and video to create a global recording studio in the cloud called “WholeWorldBand” (www.wholeworldband.com). The company was nominated for the “SXSW Music Accelerator Award” in 2013 and was one of eight finalists selected from a pool of over 500. SPACECAKE, the book, is available for download from iBooks and can be read on any Mac iOS device.